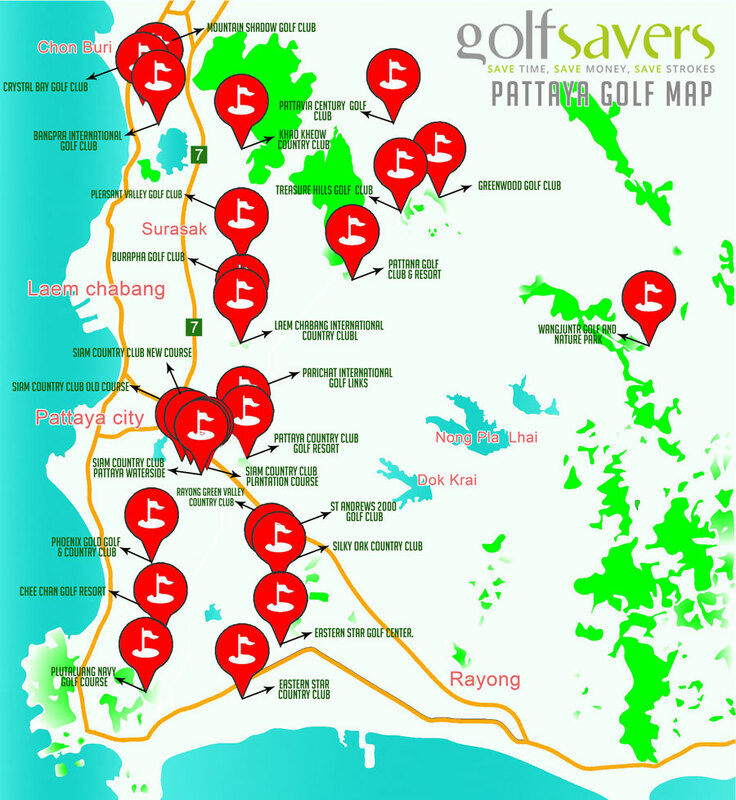 A Pattaya golf map showing the location of golf courses in the Pattaya region. Pattaya has come a long way from its beginning as a small, quiet fishing village into the top golfing destination it is today. With all the changes it is sometimes difficult to find your way around and we hope that this Pattaya Golf Map will help. You must only go back to the 1960’s to find Pattaya as a place only the inhabitants and locals would visit but things have changed dramatically over the last 50 years. Pattaya has become one of the most popular resort cities, not only in Thailand but the whole of Asia. Situated on the east coast of the Gulf of Thailand, Pattaya’s proximity to the capital city of Bangkok, means it is very easy to reach. A journey of just 100 kilometres takes you from the bustling city of Bangkok to the coastal delights of Pattaya although you should not need this Pattaya Golf Map to find your way there. While there is an airport in Pattaya called U-Tapao-Rayong-Pattaya International Airport, it accepts a very limited number of commercial flights. If you are travelling to play golf in Pattaya from within Thailand or Kuala Lumpur and Shanghai, then you may be in luck and you can get a flight direct to this airport. However, the best thing to do if arriving from outside Asia is to fly to Suvarnabhumi Airport in Bangkok and make the short journey via road to Pattaya. Suvarnabhumi Airport is the busiest airport in Southeast Asia and you will have little trouble finding a flight from Europe and North America. The golf courses in Pattaya are one of the biggest draws but there are many other things to enjoy in this region of Thailand when on a golf holiday. Great beaches, temples, theme parks, diving, water sports and day trips to nearby islands make Pattaya the perfect place for an extended golf holiday in Thailand. When planning a golf trip to Pattaya, you are advised to check the climate and the best time to travel. Pattaya has a tropical wet and dry climate, which means there are three distinct seasons throughout the year. The best weather in Pattaya for golf is between December and February when the temperature is around 26 degrees on average and the rainfall is less frequent. This time of year is known as the cool and dry season, perfect for enjoying Pattaya’s golf courses. The good news is you are spoilt for choice when it comes to playing golf in Pattaya, the bad news is you will need to decide which golf courses you would like to add to the itinerary, which can be tough. If there is one golf club which is considered a must visit when booking a Pattaya golf holiday, it is Siam Country Club. There are so many world class golf courses in Pattaya and the surrounding area, you can spend a year in the region and still not sample everything it has to offer – we hope that this Pattaya golf courses map will help you . However, if there is one golf club which is considered a must visit when booking a Pattaya golf holiday, it is Siam Country Club. There are three golf courses which combine to create the Siam Country Club and if you have time, you should play them all. However, if you are pushed to choose just one, we recommend the Siam Country Club Plantation Course. This course is regarded as one of the most difficult in Pattaya and has been the stage for the US LPGA and Thailand Open. There is nothing to dislike about this superb golf course. With stunning views of Pattaya Beach and Laem Chabang Port plus the Gulf of Thailand in the distance, you may have trouble keeping your concentration. That being said, the golf course is always in tremendous condition and with rolling fairways, blind shots, elevation changes and elevated greens, there is a lot to take in when playing the Plantation Course. Beginner golfers should not expect to score low on what is a long course but enjoy the experience of playing in such a special environment and you will have a great time regardless of the final scorecard. From one great Pattaya golf course to another and Laem Chabang International Country Club is a sight to behold. This picturesque 27-hole golf course was designed by Jack Nicklaus and is considered by many to be the best layout in Pattaya. Therefore, we advise you to try and make time for this on your Pattaya golf itinerary. Laem Chabang International Country Club combines, lakes, valleys and mountain scenery to create three sets of nine holes. They are conveniently called Mountain Course, Lake Course, and Valley Course and the names each give you a good idea of what to expect on each set of nine. You can combine any two sets of nine you like to create an 18-hole round of golf but be prepared for many hazards, some of which are man-made while others are natural. The greens are large and undulating and well protected by bunkers, so anything which is not close to the flag will leave a difficult long putt or a shot from the sand. With a choice of three distinct sets of nine holes to enjoy at Laem Chabang International Country Club, you can spend a few days at this golf club and create a new, exciting challenge every time. However, there are so many fantastic golf courses in Pattaya, we recommend you try and play as many different courses as time allows. If, having played the two tremendous Pattaya golf courses highlighted above, you fancy a change of style, head to the first-class Chee Chan Golf Resort. This is one of the newest and modern golf courses in Thailand and arguably one of the most beautiful in the whole of Asia. Chee Chan Golf Resort provides one of the best links-style golf experiences you will find in Pattaya and the surrounding area and the backdrop to the course is second to none. 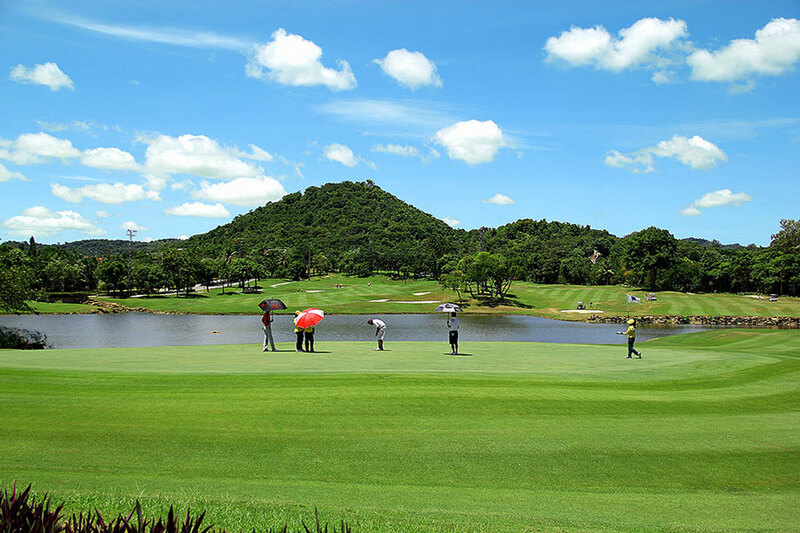 With views of the mountains, lakes, temples and overlooked by the famous Khao Chee Chan Buddha, this is a golf experience you will struggle to replicate anywhere in the world. Being a new addition to the Pattaya golf scene, Chee Chan Golf Resort boasts brand new, modern facilities including a driving range, chipping green, putting green and restaurant plus the course is in top condition. You will struggle to find a better addition to a Pattaya golf holiday than the Chee Chan Golf Resort. If you want to play one of the more spectacular and unique golf courses in Pattaya, head to the St Andrews 2000 Golf Club which is just 40 minutes away from Pattaya. This golf course was designed by Desmond Muirhead with the intention of creating something similar to that of a links golf course, such as St Andrews in Scotland. The 18-hole course plays to over 7,700 yards and is a tough challenge to players of all abilities. The narrow fairways, tight landing areas, elevated greens and tee boxes, plenty of water hazards and massive greens make the St Andrews 2000 Golf Club a real test of golf. However, perhaps the biggest draw for many players are the two par-6 holes, which stretch over 800 yards each. While the purist may not enjoy seeing par-6 holes on a golf course, they certainly add a different dimension to the round and get players thinking about a new challenge and how to approach the holes. Even if you are not keen on the idea of a par-6 hole, you would be doing yourself a disservice if you did not consider adding the St Andrews 2000 Golf Club to your list of golf courses to play in Pattaya. Having played some of the best but toughest golf courses in Pattaya, perhaps it is time to try something which offers a good opportunity for a low score? Pattaya Country Club and Resort was established in 1993 and plays to 6,775 yards, which is a little shorter than some of the other top golf courses in Pattaya. Pattaya Country Club and Resort is just 20 minutes away from the city centre, making it a good choice if you fancy a quick round early morning or late afternoon. There are several holes on the golf course with split fairways and these provide a choice of easier and more challenging paths to the green. For those whose get nervous playing around a lot of water, there is good news as water only comes into play once on this golf course. The final three holes are regarded as the most difficult on the course but with gentle, rolling fairways and good putting surfaces, Pattaya Country Club and Resort presents golfers of all abilities to come away with a low score. While it is great to have huge choice of professionally designed and created golf courses in Pattaya, there is an altogether different experience at Plutaluang Royal Thai Navy Golf Course. Established in 1969, this golf course is a natural course which surrounds a large reservoir and the nature is a joy to behold as you complete 18 holes of golf. Whether its flowers, birds or even monkeys, there is an aspect of nature which comes to your attention on every hole when playing the Plutaluang Royal Thai Navy Golf Course. There are four sets of nine holes which you can combine to make an 18-hole round called the North, South, East and West. The East and West were constructed over 20 years after the North and South, so if you want to experience the course as it was when first created, play the first two sets of nine holes. Plutaluang Royal Thai Navy Golf Course may not be the most modern or up to date golf course in Pattaya but if offers a round of golf unlike any other in this region of Thailand. 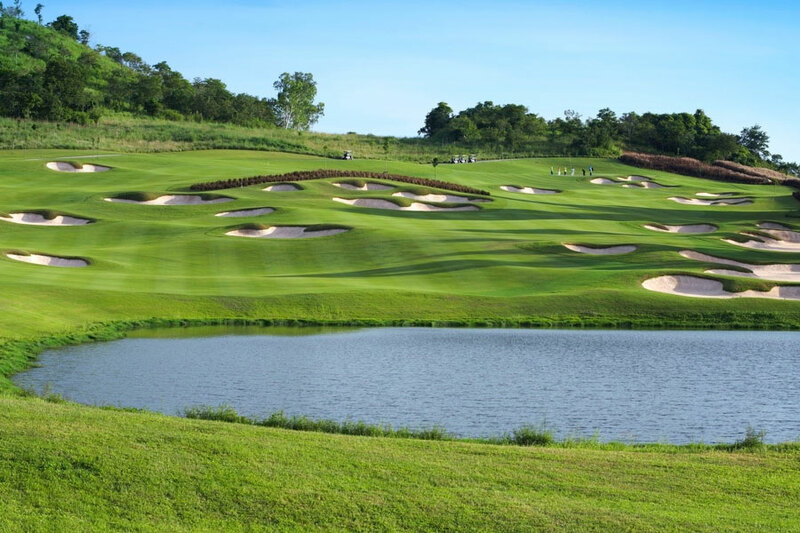 Being just 30 minutes from Pattaya, it makes a great addition to a Pattaya golf holiday. Back to the courses used by the professionals and regarded as one of the best golf courses in Pattaya is Phoenix Gold Golf and Country Club. Designed by Dennis Griffiths and opened for play in 1993 the Phoenix Gold Golf and Country Club has played host to the European Tour thanks to the Kings Cup and the Ladies European Tour with the Thailand Open in 2017. 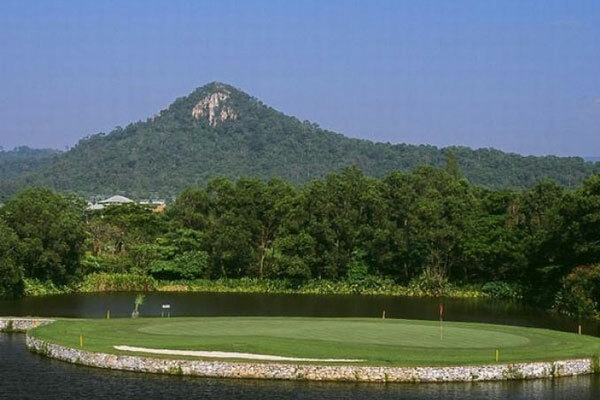 This 27-hole course offers lovely views of the mountains and the Gulf of Thailand. 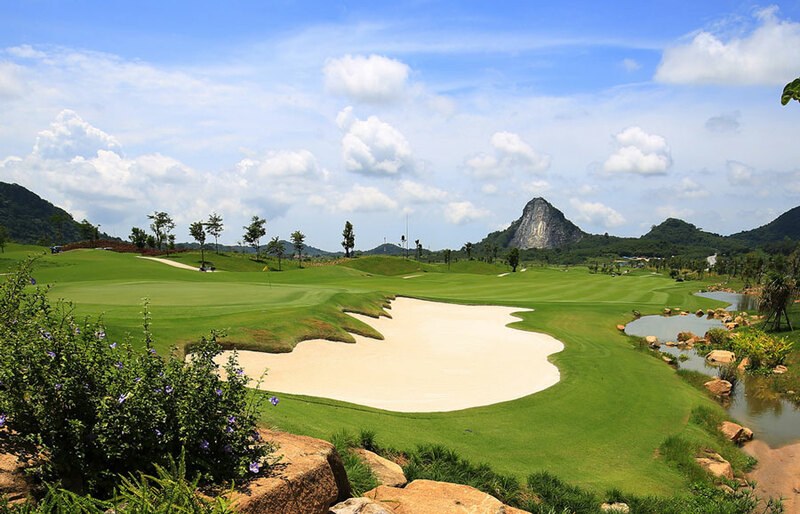 The 27-hole course has three sets of nine holes called Ocean, Lake and Mountain which each offer lovely views of the mountains and the Gulf of Thailand. The holes are lined by palm trees and the course offers rolling fairways, contoured greens and little in the way of water compared to many other Pattaya golf courses. The only set of nine holes which features water is the Lake Course and the name gives it away. However, the Lake Course is the shortest of the three sets of holes and the water is mainly small ponds as opposed to large expanses of water running alongside the fairways and greens. Many players consider the Mountain Course to be the best of the three loops and its hard to disagree with tremendous views of the jungle clad hills and mountains around the course. There are so many brilliant golf courses in Pattaya, it is hard to know where to begin when planning a golf holiday. The golf courses highlighted above provide a good balance of course style, scenery, facilities, terrain, difficulty and distance from the city. You could easily spend days at a resort such as Siam Country Club, boasting three excellent golf courses but then you would be missing out on many of the other top Pattaya golf courses. The best advice is to look at each of the golf courses in Pattaya and choose those which you feel you will enjoy most. Not every golfer is the same but if you select from those mentioned above, you are guaranteed to have a great time playing golf in Pattaya.